There is not one weak poem in this wonderful collection. 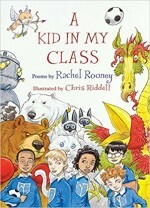 Rooney introduces us to a classful of children, all of whom I recognise. The verses are accurate, thought-provoking, honest and beautifully illustrated by Chris Riddell. It has already found a place on my ‘to be read again and again’ book shelf.